BUKH – the most reliable marine engines in the world. With more than 100 years of experience BUKH A/S is one of the world’s leading OEM manufacturers of Marine Diesel Engines for lifeboats, fast rescue boats and work boats. In 1995 we decided to merge our two companies Motorfabriken Bukh A/S and Aabenraa Motor- fabrik Heinrich Callesen A/S. At first into the name of Aabenraa Motorfabrik – a name we changed to BUKH A/S in 2010. Lifeboat engines are our main product range. But the selection of engines has been extended to cover other power ranges and segments through close co-operation with acknowledged global partners who all share our vision of commitment and quality. The quality of our products is ensured by type approval of the engines and ISO certification of BUKH A/S. 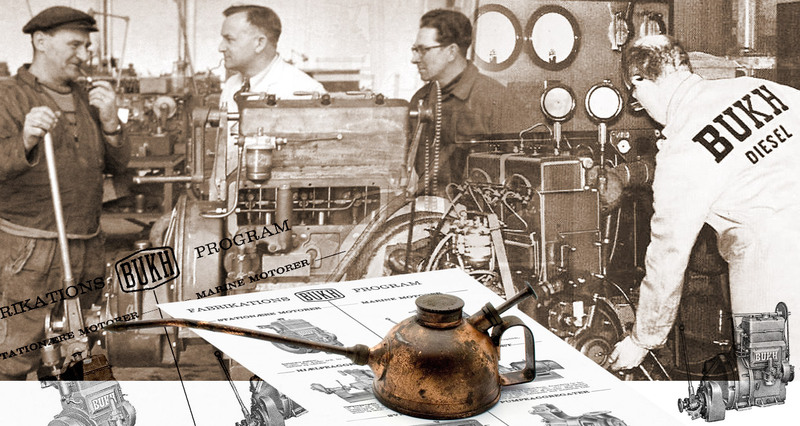 Founded in 1899, Aabenraa Motorfabrik launched their first marine engine in 1904, the same year as Motorfabriken Bukh was founded. While Aabenraa Motorfabrik focused entirely on supplying fishing boats and freighters worldwide with heavy-duty Callesen engines, Motorfabriken Bukh engaged successfully in the tractor and emergency power generating segments and developed engines for small work boats and pleasure boats. This kind of engine turned out to be very suitable for lifeboats, so Motorfabriken Bukh phased out the production of tractors and generators to focus on lifeboat engines. Today we continue to improve our engines and extend our range to meet the markets’ demands.